On Peak Tone 6 an effort of Spiritual Growth takes on the power of momentum. Compared to the Art of a Dance, when all the steps are learned and practiced, the effort becomes an Expression of Movement. 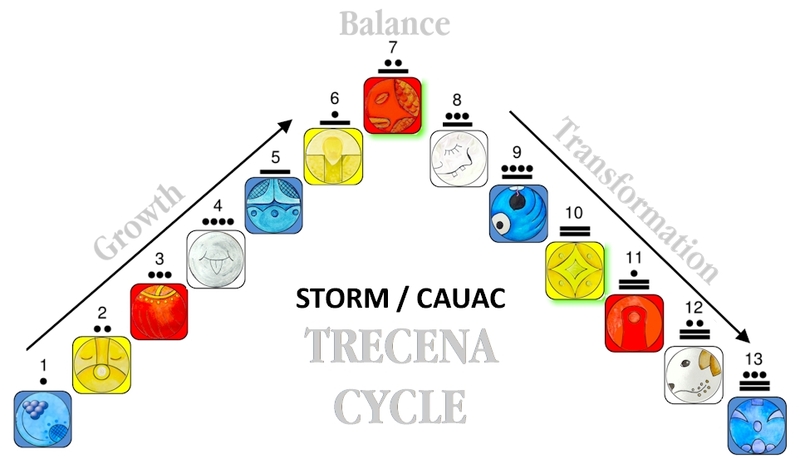 The Storm/CAUAC trecena is guiding a movement to manifest the Renewal and Regeneration of our Spirit. Turning to Home is the Answer whenever we see a storm on the horizon. “Home” is our Spiritual Center where we hold the Authority of Intention. “Home” is where we have the unbridled freedom to Express who we are. Through our Free Will to Choose, “Home” is where we define the correspondent movement for a Divine Intervention. Seed/KAN is a Day Sign of family/genetics, sexuality, reproduction, germination, and multiplication. 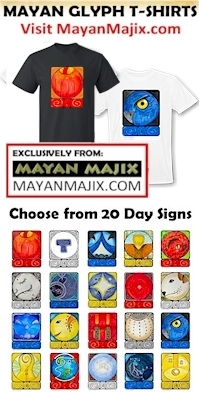 Corn is the seed the Maya associated as a symbol of Human, displaying the colors found in every Human body, and sharing the same cycle of gestation. KAN relates to the Force Inside the Seed that maintains the integrity of identity. It represents our Divine Design, the Ultimate Authority that determines what we will grow up to be. Our Intention of Movement directs the course of our Destiny. The Cherokee Day Sign the Dragon relates to this Force within the Seed. This Dragon Force reflects the Power to Clearly See what we are Becoming. We started out as a tiny seed. As a sprout we took on the leaves of our identity and saw that we were meant to grow up as a tree. In the 5th uinal of Movement, we are realizing our Meaning and Purpose. We are growing up with a purpose to multiply, so we might bear Fruit, holding the seeds of a Higher Generation of Spirit. Our Intentions can become a permanent change by transforming the seeds of a new generation. The Dragon has been a symbol of Life Force down through history. The Earth’s ley lines, also known as “dragon lines,” carry an altered magnetic field that vibrates at a different frequency from surrounding areas. Human’s state of mind and behavior are influenced by vibration. The vibration that holds the Power of Identity is the Force that lies in our Center. The Elders on the traditional Medicine Wheel path, identify the dynamics of Spirit as Human in motion. Defining Human as a Being of Vibration, what we say or do (sound and movement) creates the Vibration of who we are. The Elders acknowledged the Sacredness of Human Movement. “Human washing the dishes” is Sacred as a fundamental movement of everyday life. “Human sweeping” is a Sacred metaphor of an Intention to clear away the ashes of our past. The Highest State of Human awareness is the Consciousness of “Human Being.” This represents the Divine Consciousness of Who We Are. The world’s definition of “Human Being” is a static characterization. In Spirit, “Human Being” defines Human by a dynamic state of movement. The most accurate representation of who we are is defined by what we are doing. Human Loving, Human Sharing, and Human Forgiving are movements that Define a Divine Identity. Our Spirits are transformed by the Movements we Choose by Intention. Tone 6 offers the energy of Flow. Through repeated effort, we establish an instinctual Rhythm and Pattern of Movement. The seed is said to draw abundance, as if cast by a net. Seed is capable to push away from negative influences that would create obstacles or hold us back, like a clearing of Spiritual Karma. The germinated Seed illustrates a Miracle in the Power of a small tender shoot to work its way around and through any obstacle it might encounter. The Direction of the Seed is guided by its sense of gravity. The weight of the world that pulls us down, our darkness, offers the Clear Vision for finding our way toward the Light. The Divine Instinct that draws us upward, holds authority over the weight that holds us down. The Seed is our everyday-evidence of Miracles. Regardless of its surroundings, when it meets fertile soil, a seed is capable to overcome the obstacles in the dark. We are given the Momentum to complete a climb of Spiritual Growth through an experience of Seeing Clearly that we are establishing a pattern of turning within. By turning again and again to a source of Divine Consciousness, we are creating a well worn path to Spirit we would naturally follow. Patterns of movement reveal the evidence of transformation. The steps made of stone that lead to the top of the pyramid show the wear of a well-worn path. Following the same path toward Higher Consciousness, we draw upon the Spiritual Momentum of those who climbed before. To all my relations, may we claim our own Power of Momentum to reach the Peak of our Spiritual Climb, as Correspondent with the movements of the Ascended Masters. The Grandfathers and Grandmothers that walked the path of Beauty, cleared a way for us to grow into the Consciousness of our Sacred Identity. May we see how our movements define the character of our identity. May we see how engaging the movements of Human Loving, Human Sharing, and Human Forgiving, we will be transformed as we see ourselves expressing the Movements of Divinity. May we see how, through this new perception of our Self, we would hold the Power of Believing we are ALL on course to manifest our Divine Meaning and Purpose. I’m grateful that the effort we make by Spiritual Intention is always multiplied to abundance. Cherokee, Dragon/UKTE’NA: Dragon’s symbol is Draco winding between the Little Dipper and Big Dipper. Dragon is the Corn Spirit, symbol of dual personality of Corn Mother and Maiden. Fertility and pro-creation from generation to generation. The word dragon means ”eye, to look at, to see clearly”. Spirit brings energy of Lawgiver, Justice, vigilance and protective, loyal unto death. Ley lines in China are “dragon lines”, energy is sometimes called “orgone energy,” pyramid power or magnetic force. Pyramids and kivas are collector portals for this energy, known as vortexes. Dragon energy beats a path everywhere, stirring things up with a big stick in tune with the beat of the drum, heartbeat of the Earth.